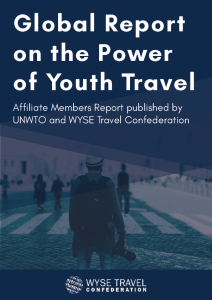 WYSE Travel Confederation and UNWTO announce the release of the Global Report on the Power of Youth Travel, volume thirteen of the UNWTO Affiliate Members Report series. First published in 2011 as volume two of the Affiliate Member report series, the 2016 volume is available as a free download and showcases research findings, best practices and reflections from more than 20 public and private sector organisations from the across the globe. The volume highlights the positive impact that travel has on young people and the destinations that they visit. The Global Report on the Power of Youth Travel follows the updated estimate of the size of the global youth travel market announced by WYSE Travel Confederation and UNWTO at the World Youth and Student Travel Conference (WYSTC) in September 2015. The analysis, done by WYSE Travel Confederation in collaboration with UNWTO estimates that travellers aged 15 to 29 represent 23% of international tourist arrivals.